On a mission to put the care back into healthcare communications, two sisters have launched Skin and Blister – a full-service creative agency. Skin and Blister gather true insight to make complex information meaningful, accessible and useful to all. A sizable new business win is proof that Skin and Blister is an agency to watch. The agency was born from a point of shared frustration. It comes with a promise to put clients and their challenges first. Skin and Blister offers the full range of pharmaceutical marketing services. It also has a division dedicated to clinical trial patient recruitment and retention. 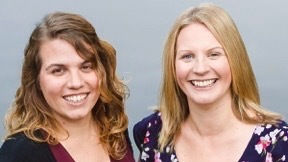 Raised by healthcare professionals, Katie and Fiona have healthcare in their blood. They have spent their entire careers working towards the launch of Skin and Blister. Following a stint in medical communications, Katie went on to win multiple creative awards as a healthcare copywriter at Pan Communications, and later at Lime Advertising. She then worked extensively as a freelancer for small-to-large network agencies across the industry. Fiona gained extensive client services experience at PBC, later Huntsworth Health, then through 7 years as a freelancer. She became a patient recruitment and retention expert, thanks to freelance work for Clinical Research Organisations, including Quintiles and INC Research.